As he stood at his grandmother’s side rolling out pastry, putting it into a tin and filling it up with all the good stuff that makes a pie a pie, there was little indication at the time that with every stroke of the rolling pin was one more stroke towards a passion and a career. But that is exactly what happened to Rob Lizotte, chef at Edward Street Market Bistro, when at the age of five, he helped his grandmother make dessert. It is his earliest food memory and through his self-described cooking style of “rustic refined”, he hopes to conjure up similar memories in those who sample his food. 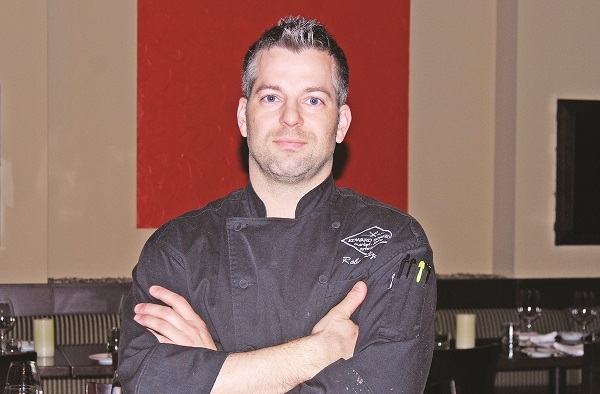 Mr. Lizotte is one of five local chefs preparing to face off this Thursday as the Aurora Community Centre is transformed into kitchen stadium for the first Iron Chef Aurora. The competition was developed by Debbie McGrath and Tim Newnham of Habachat, a local social media company, as a way to highlight everything that local restaurants have to offer, all the while raising significant amounts of money for local charities. Mr. Lizotte is paired with Haddan Eby Endowent Fund which supports Camp Ooch, a camp for children with cancer. Each chef is tasked with creating a menu incorporating the same two secret ingredients and the winner will be chosen by those in the audience. Beyond the Thursday event into the weekend, the Community Centre will continue to be a destination for Aurora foodies as the Taste of Aurora festival runs through the weekend. From the early days cooking with the family matriarch, it was soon clear cooking was what Mr. Lizotte wanted to do with his life. She showed him the importance of cooking things properly for a family, but also that cooking goes beyond the actual act of preparing food. It is the whole experience, he says, of sharing it with others and having people share in the experience together fuels the passion to get to the next level. He first honed his craft through high school with part time jobs, but sampled other professions while at university, but nothing but cooking seemed to click. Since that time, he has also seen the collective palates of the community evolve as the cooking market evolves with continuing influences from sources such as Food Network, which has exploded in recent year. With this development, more international flavours and ingredients are more readily available and becoming standards. Ontario is also blessed, he said, with diversity, and this is reflected through cooking. What Mr. Lizotte will have to offer at Iron Chef Aurora this week, he says, will be, however, a bit of a step back to the simpler fundamentals of cooking.